I decided to start this blog in June, six month into this journey. The reason why; I have a paranoia of slipping back. I don't mean for a couple of weeks I mean forever so I need something to keep me on the straight and narrow. I also have struggled to find a resource source, so I've compiled one. Its a collection of the best bits of advice I've been told, listened to on podcasts, read in books or from the internet. These references I have tried to put on the references page. This page will be organic and the references will grow with me, what I do not want is for this blog to appear pretenscious; I want it be down to earth, factual and most important helpful. We'll move on with some facts; a bit disjointed I know but just a reminder that we need to find motivation and that can be anywhere. No one plan is for all. I’d started to read about the benefits of Creatine, often used by body builders but other studies indicated some benefits for endurance and even cognitive function. This is all good stuff, but to realise the full potential of creatine it’s crucial to step back and look at the bigger picture. A one hour run is about 4% of your day. The other 96% is recovery and health – here, creatine can be a real weapon in your arsenal. I wanted to reintroduce whole foods; and banana was top of my list. The truth is that bananas are a real power food—as long as you don't overdo it on the portion size. An Appalachian State University study, which compared bananas to a sports drink during intense cycling, found that bananas offered several advantages. In addition to providing antioxidants not found in sports drinks, they pack more nutrients and a healthier blend of natural sugars. In the study, trained cyclists gulped either a cup of a carb-rich drink or downed half a banana every 15 minutes during a road race of two-and-a-half to three hours. Blood samples taken before and after revealed that the cyclists experienced similar performance effects, and a greater shift in dopamine—a neurotransmitter that plays a role in movement and mood—after eating the bananas. Some research also indicates that inadequate dopamine may be tied to obesity. But bananas aren't just for athletes. While it's true that bananas do pack more carbs per bite than other fruits (because they're lower in water content), there's no need to shun them, even if you're trying to lose weight. Bananas are a rich source of potassium, an essential nutrient in the body which, in addition to reducing blood pressure, helps support muscle maintenance and acts as a natural diuretic that alleviates water retention and bloating. The high levels of vitamin B6 in bananas also helps maintain healthy blood sugar levels and is vital for the production of feel-good neurotransmitters like serotonin and norepinephrine. Bananas are also packed with fibre, which boosts satiety and improves digestive health. Fibre will prove to become more important in my dietary consideration; more info in the additional info tab. 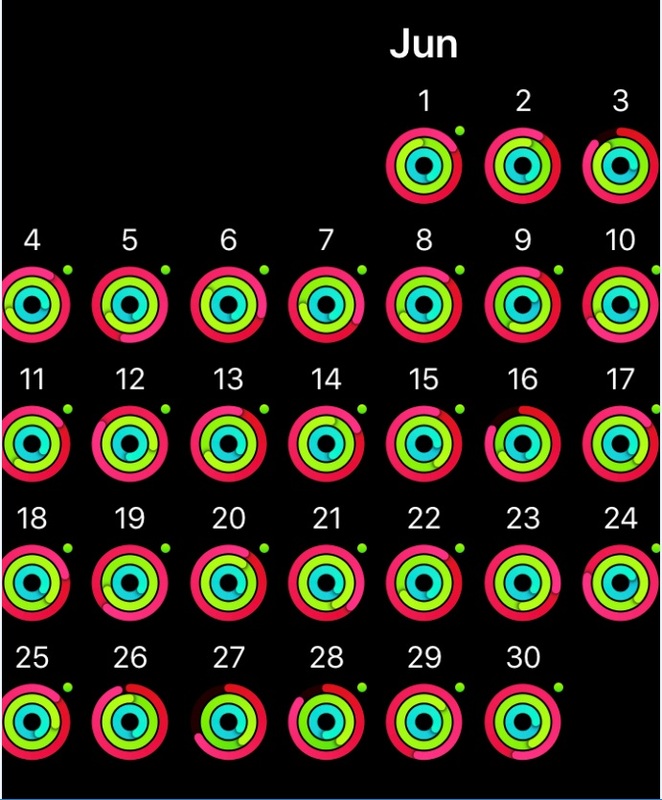 My exercise calendar is posted above; again more Gym; no swimming for the month. I’d started to monitor my monthly active calorie burn; in this case 38,081, a slight decrease but a very similar burn to the previous month.